On Thursday, November 1, 2018 at 12:50am, two female suspects entered an apartment building located in the 2000 block of Regina Street in Ottawa. The two female suspects knocked on an apartment door and once the door was opened they forced their way into the apartment where they assaulted the tenant and stole a cell phone. 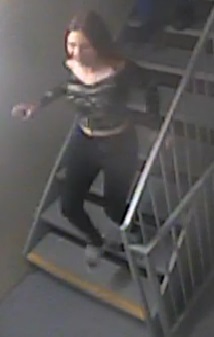 The two females were captured on CCTV running down a stairwell. 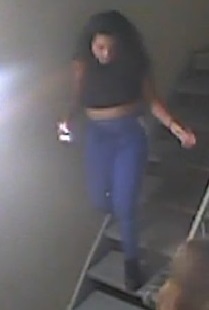 The suspects are described as: #1 Light-skinned black female, early 20’s, 5’7(170cm), 165lbs (75kg), black shoulder length hair, purple pants and a black top (see picture.) #2 White female, early 20’s, 5’3 (160cm), 120lbs (54kg), dirty blond shoulder length hair, black pants and camouflage top (see picture.) Anyone with information regarding the identification of these two suspects is asked to contact the Ottawa Police Robbery Unit at 613-236-1222, ext. 5116. Anonymous tips can be submitted by calling Crime Stoppers toll-free at 1-800-222-8477 (TIPS) . Remember Crime Stoppers does not subscribe to call display, we will not ask your name or record your call and you are not required to testify in court. If your information leads to their identity, you could qualify for a cash reward of up to $2000. You can follow us on Facebook, YouTube and Twitter.